PLEASE NOTE: WE ARE NOT A COMMERCIAL BUSINESS. WE DO NOT OFFER TANDEM PARACHUTE JUMPS. WELCOME TO PATHFINDER PARACHUTE GROUP IRELAND. 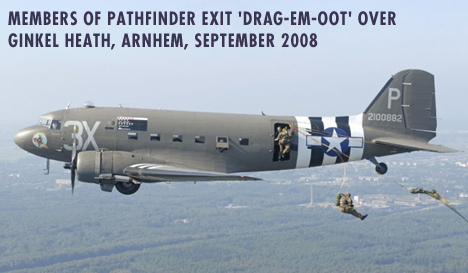 Pathfinder Ireland is a branch of the Pathfinder Parachute Group. Our aim is to promote military style round canopy parachuting for Irish people and other nationalities resident in Ireland. This video below is designed to give people an idea as to what we're about and what we do on a regular basis. We hope you enjoy the it and we'll see you on the Dropzone with us soon. The main purpose of Pathfinder is to commemorate military parachute drops and honour veterans. To do this we jump onto historical dropzones such as those at Arnhem in Holland and dropzones used on D-Day in France. We are officialy invited to partake in these events. Pathfinder Ireland is a non-political organisation. We are dedicated to promoting friendship between nations worldwide through the medium of round canopy parachuting for recreation. Pathfinder Parachute Group is an international organisation. We are established in over twenty countries worldwide including Holland, Ireland, U.K., Denmark, Sweden, U.S.A., China, Canada, France, South Africa, Belgium, Poland, South Korea, Germany, Portugal, Czech Republic, Estonia, Slovakia, Chile and Australia. A true reflection of the Airborne Brotherhood! Many of our members are world record holders and our jumpers also have expertise in various disciplines of parachuting from HAHO / HALO Jumping to Base Jumping. One of our members is also a part of the famous 'Pieces of Eight' skydiving team. However you will find no 'Skygods' within our ranks...just people who jump Rounds for the fun of it! Oldest Active Member: 82 Years of Age and still jumping! *Thanks to Bob Hughes for the use of the Dakota C47 photo on our banner.